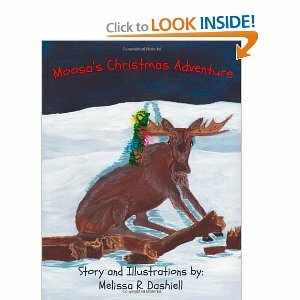 In book two of the Moosa series Moosa finds himself helping Santa deliver presents after Dancer gets injured. A mischievous young thief is hurled through time on an adventure to discover forgiveness and the true meaning of Christmas. 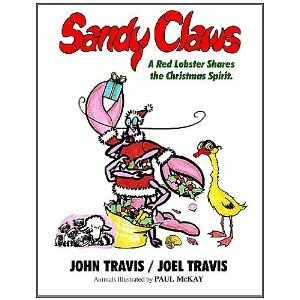 Sandy Claws is a humorous animal parody of the Christmas stories, featuring a red lobster, appropriately named “Sandy Claws.” His quirky animal friends share the entire Christmas experience, culminating in the daring Christmas Eve flight to provide gifts for those in need. The satirical spoof features the warmth of close friends, danger, and subtle lifetime lessons. Originally a bedtime story the author told to his small children some thirty-five years ago, the narration is being released as a book for his grandchildren’s generation to enjoy. Carrie is a little girl living in a sunny warm place. Soon, her family moves north. Everything is new and exciting as Carrie experiences a cold winter for the first time. Christmastime has arrived! 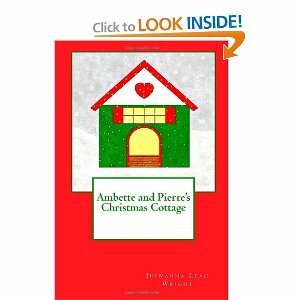 Ambette and Pierre Philippe hurry off to their favorite park in Paris, France. The 4 year-old twins are bringing a Christmas surprise to their two favorite ducks, Louis and Bona. What can the surprise be? The Marshalls, a family wrapped up in their holiday traditions, can hardly wait to celebrate the season by decorating their Christmas tree. But to their surprise, their tree, Treena, has come to set the record straight and teach them what Christmas is really about! The art and prose of Guido van Genechten returns in this classic Christmas story of one bunny’s pursuit for a Christmas tree. It’s almost Christmas, but Ricky’s family doesn’t have a tree yet because his parents have been so busy. Dad begrudingly takes Ricky on his tree quest, as long as they make it quick. While Ricky takes in all the winter beauty and fun around him, his father pushes him to fine the tree and get back home. When the Christmas tree falls off the sled, Ricky’s enthusiasm for winter play becomes infectious, and soon Dad and Mom are caught up in the joys of the season. This is a beautiful story made even lovelier by van Genechten’s adorable artwork. I love his books because they capture the heart of a child so well. As I was reading , I wondered if this is how my kids see me–constantly working, not appreciating the little things that make life worth living. 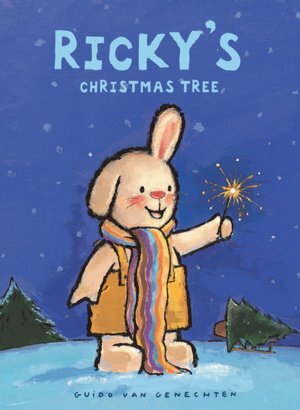 Ricky’s Christmas Tree is probably going to end up being my favorite van Genechten book. He’s truly done a wonderful job with this one. It would make the perfect gift any time of the year. I received a free copy of this book from the publisher in exchange for my honest opinion. I received no monetary compensation of any kind for this review. 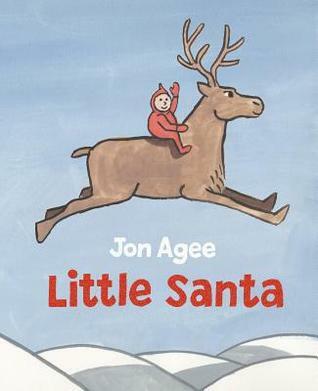 This is a book I read for The Christmas Spirit Reading Challenge. To see my original list visit here. 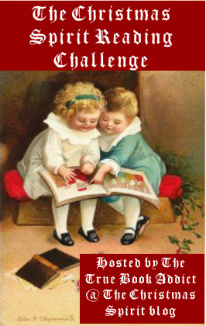 I have now read 6 books for this challenge. Two beloved wintertime songs have been added to pictures thanks to Tiger Tales Books and talented artist Veronica Vasylenko. The mouse family is celebrating taking a wintertime sleigh ride as they pack up the adults and the children in their “one-horse open sleigh.” Over the hills they go, bells jingling on the horse’s tail, playing their instruments, and arriving at Grandma and Grandpa’s house. 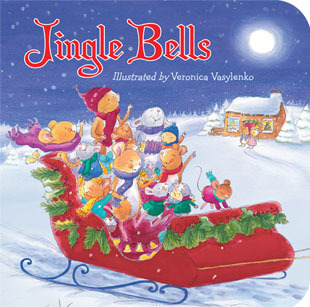 In this beautifully illustrated padded board book, Jingle Bells the song comes alive in a new way. 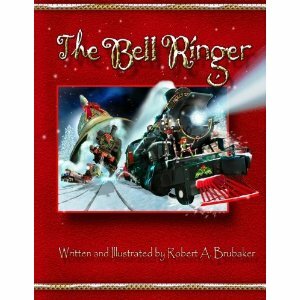 The glitter varnish on the cover and inside pages gives it a wintery glow that will captivate young readers ages 2- 5. 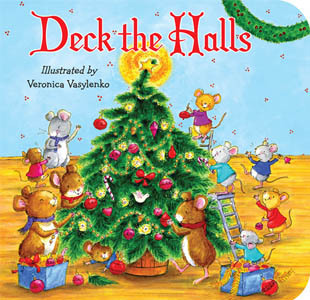 The mouse family returns in Deck the Halls, where they are getting ready for Christmas by decorating the tree, sitting around the Yule log, baking treats, and entertaining friends. Like Jingle Bells, Vasylenko has captured the joys of the season with her little mouse family. With lights and door jambs decorated with holly leaves, and holly berries adorning the walls, there is so much for young readers to enjoy. These books are quick reads that will be fun to read aloud and sing aloud. They would make great storytime books. I like that they remained consistent between the two books, formatting them the same, using the same font on each, and using the glitter varnish on each padded board book. These are definitely books you and your kids can enjoy all season long! I received FREE copies of these book from the publisher in exchange for my honest opinions. I received no monetary compensation of any kind to provide this review. This book completes 4 out of the 4 books I agreed to read for The Christmas Spirit Reading Challenge. To see my list visit here. 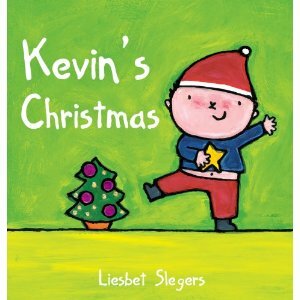 Toddlers will love sitting down with you to read Kevin’s Christmas by Liesbet Slegers. It’s Christmas time. Kevin and his family get ready. They put up a tree, set the nativity at the base of their tree, send out greeting cards, and buy food for the Christmas meal. How exciting! I love Slegers’s books. She really knows how to get in touch with a child’s heart and mind. 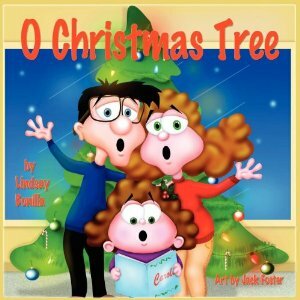 In this adorable new release in her Kevin and Katie series, young Kevin gets involved in Christmas preparations for the first time. The story speaks to toddlers using words they will be familiar with and has Kevin acting in ways similiar to this age group. Young readers will feel his excitement and joy in sharing this holiday with his family. The artwork Slegers creates for this one is wonderful. It’s simple, yet uses great colors that will captivate young readers. I also like the multicultural aspect of the book. When Cousin Sally arrives we see she is African American. It’s a subtle message, but one that makes you appreciates family diversity, and can help show kids that differences are great. This is a sweet story that would make a perfect gift. I received a FREE copy of this book from the publisher in exchange for my honest opinions. I did not receive monetary compensation of any kind for this review. This book completes 2 out of the 4 books I agreed to read for The Christmas Spirit Reading Challenge. To see my list visit here. This is happy day! 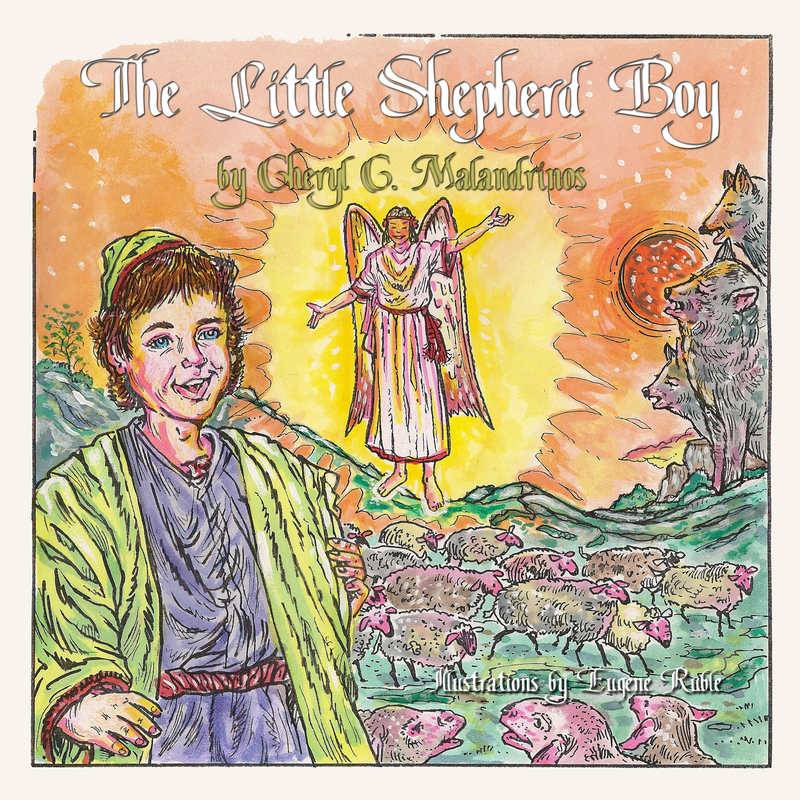 When I checked my email tonight, Lynda Burch, owner and publisher of Guardian Angel Publishing had sent me a copy of the cover art for The Little Shepherd Boy, which is due to be released this fall. I was already familiar with Eugene Ruble’s work before he was contracted to design The Little Shepherd Boy, so I knew the cover art would be wonderful. I would appreciate some feedback from you, the readers of this blog, and hopefully future fans of Obed’s story, The Little Shepherd Boy. What do you think of the cover art? Thanks for all your support. Look for more information regarding The Little Shepherd Boy as we get closer to release time.